December is upon us, and with full moon ceremonies and rituals happening across Bali we send you blessings of fullness in your own life. Round out your year with a sense of abundance and satisfaction. Turn enthusiasm into action invoking a sense of completion to your 2018 whilst planting seeds for 2019. This full moon charge come's to you as an invitation to our many classes, workshops, immersions and Yoga Teacher Trainings. Why not enjoy our oasis and contemplate the universal mantra of "Om Purnamada Purnamidam", "from the completeness comes the completeness". It seems a fitting way to end the year and manifest into the next. Christmas Eve (24/12), Christmas Day (25/12) & New Years Eve (31/12) - classes start as usual, last class for each day will start at 4pm. The Yoga Barn will close by 6pm each day. Galungan Day (26/12, a beautiful Balinese holiday, you can read about here) The Yoga Barn will open in the afternoon with the first class starting at 2pm. Plus since it is the gift giving season, keep in mind our GIFT VOUCHERS are available for purchase online. Make holiday shopping easy for a loved one living locally or for a friend soon to visit Bali. Our monthly workshops and events offer such a rich variety of sound, movement, healing, yoga and specialized arts. Spaces are often limited so booking via our website ensures you don't miss out and you get to enjoy Early Bird discounts. Please note that class cards are not accepted as payment for these special events. 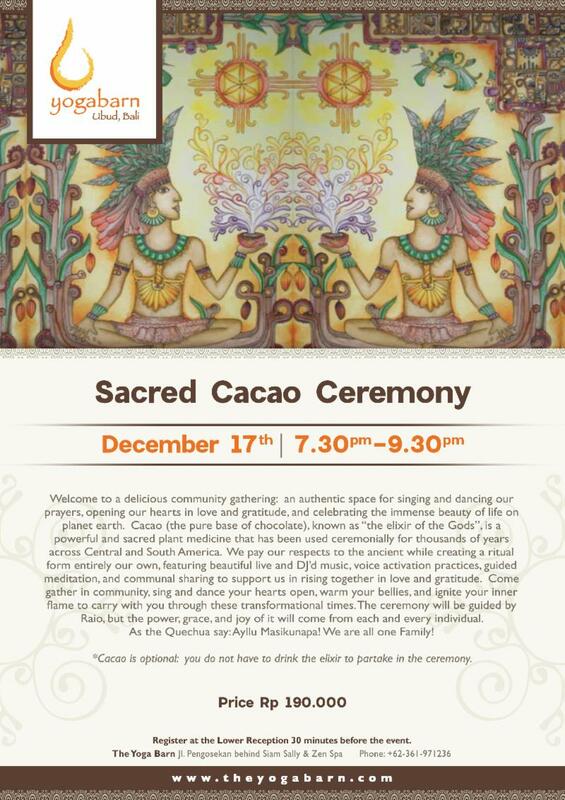 Cacao has been used as a sacred medicine for thousands of years. Known as the food of the gods, it provides a heart opening experience that will get you deeply in touch with your body and enliven your senses. 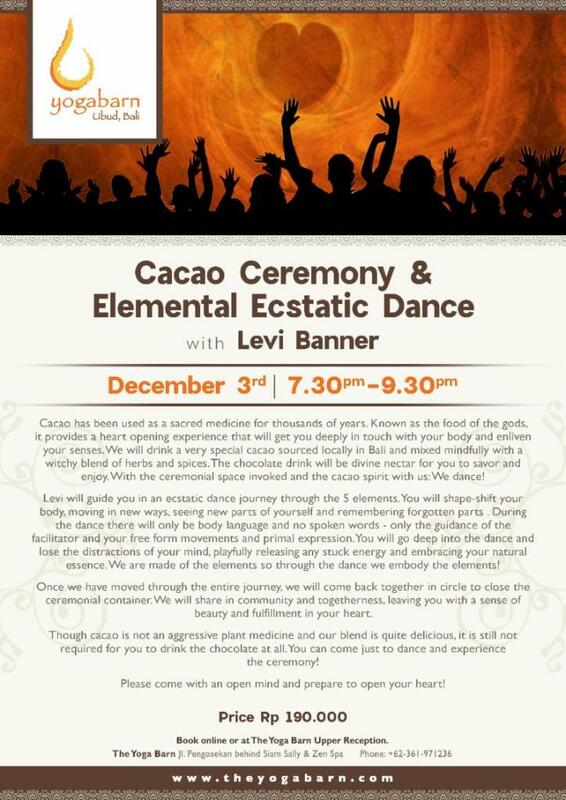 Drink a very special cacao sourced locally (not mandatory) in Bali with a witchy blend of herbs and spices. Open your heart and mind in a night of dance. 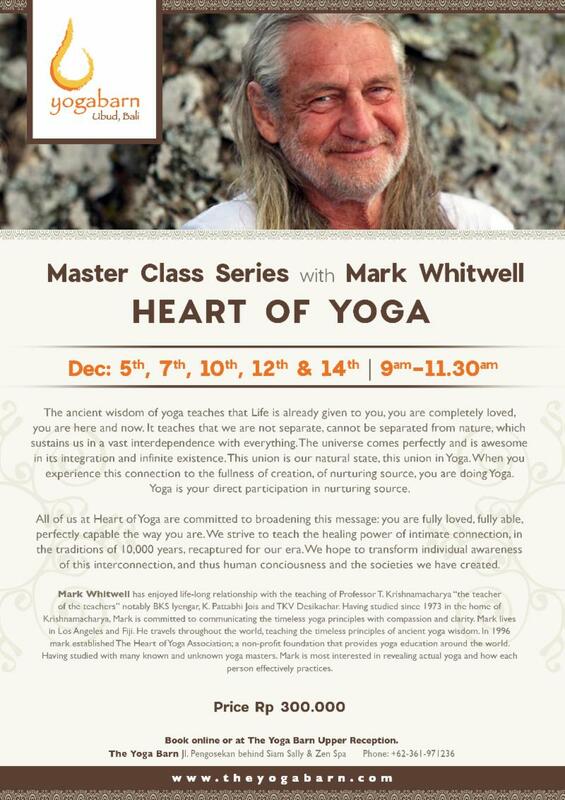 Share a morning with the ancient wisdom of yoga as it is taught by Mark Whitwell through discussion, breath & gentle movement. Learn that Life is already given to you, that you are completely loved, that you are here now. Learn that we are not separate, cannot be separate from nature, which sustains us in a vast interdependence with everything. The universe comes perfectly, and is awesome in its integration and infinite existence. This union is our natural state, this union is Yoga. 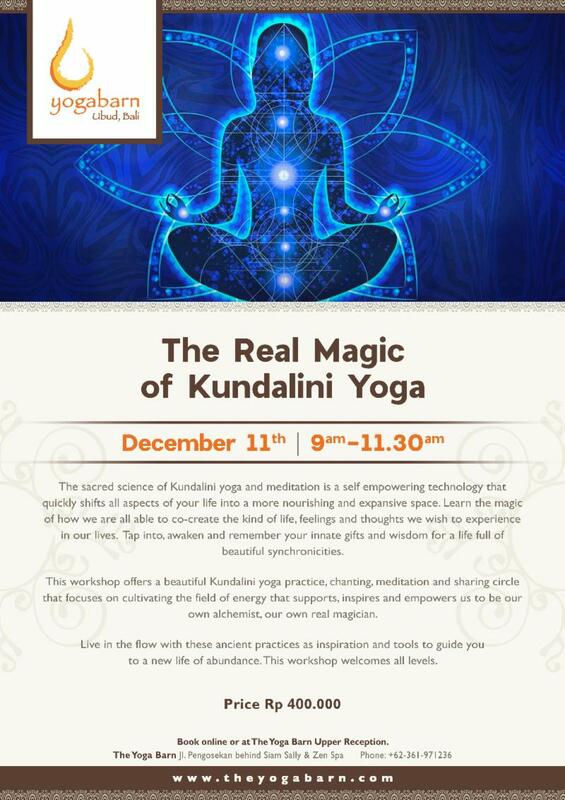 The sacred science of Kundalini yoga and meditation is a self-empowering technology that quickly shifts all aspects of your life into a more nourishing and expansive space. Learn the magic of how we are all able to co-create the kind of life, feelings and thoughts we wish to experience in our lives. Share in a beautiful Kundalini yoga practice, chanting, meditation and sharing circle and cultivate the field of energy that supports, inspires and empowers us to be our own alchemist, our own real magician. The focus of this workshop is on creating flexibility, mobility and strength, using slow flowing movements to circulate the body’s energy (qi). It will unlock stiff joints, muscles and disentangle fascial fibers. 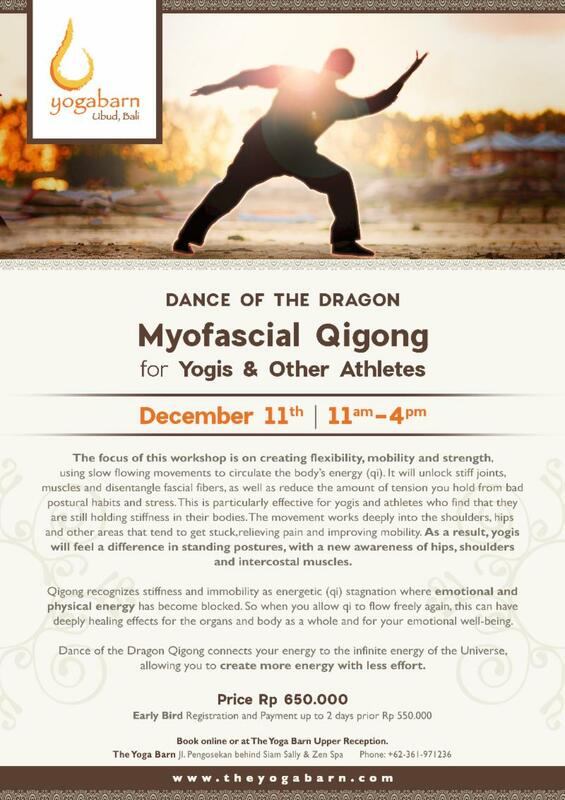 This is particularly effective for yogis and athletes who find that they are still holding stiffness in their bodies. Dance of the Dragon Qigong connects your energy to the infinite energy of the Universe, allowing you to create more energy with less effort. Tao is the path of living in health and harmony with nature. Thousands of years old, Tao acknowledges the infinite wisdom of the body and mind, and that everyone has self-healing ability. 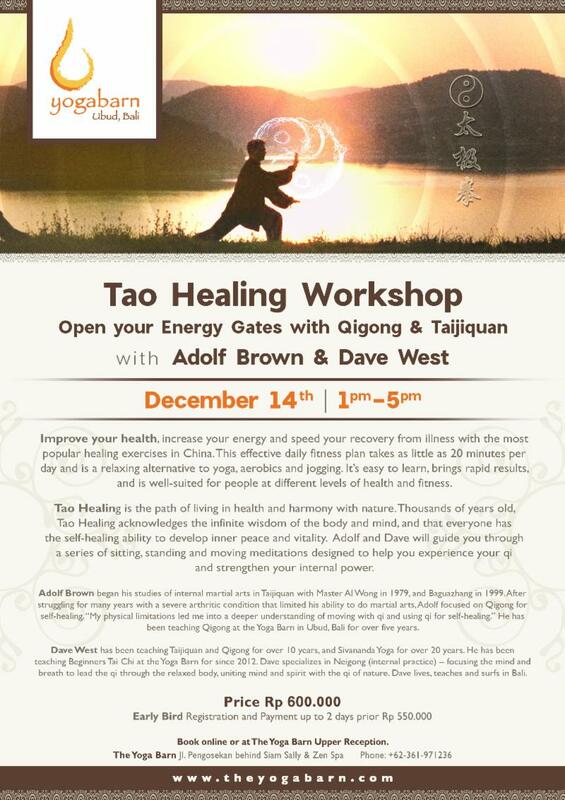 This workshop will explore Taoist theory through student’s direct experience of qi. Adolf will guide you through a series of seated, standing and moving meditations designed to experience, build and cultivate qi. How does the ancient wisdom of yoga philosophy and spiritual inquiry translate tangibly into our practice of modern yoga asana? As we unravel that which is repressed and stuck in our body - mind, what are the practical tools to help us be with what arises and liberate us from suffering to Self-Realization? What is the path to ‘awakening’ really all about?In Yin Yoga we learn practical mindfulness tools to meet ourselves at the edge of our comfort zone to heal. UpClose is heart-warming, NON-sexual intimacy workshop that's WAY more fun than work! Learn how to get closer to your loved ones while having fun in beautifully guided connection games. Take away practical skills you can apply in ALL your relationships - with your lover, friends and even family. Recommended for both singles and couples. Come alone or with a partner! Cacao, the pure base of chocolate is known as “the elixir of the Gods” that has been used ceremonially for thousands of years across Central and South America. Come to gather in community, sing, dance your heart open and ignite your inner flame. This delicious community gathering is an authentic space for singing and dancing our prayers, opening our heart in love and gratitude, and celebrating the immense beauty of life in this earth. Experience a life-changing course of profound, powerful and transformative healing processes that boost your growth on all levels and induces a shift in consciousness with respect to prosperity and abundance in all aspects of your life. This is a special sacred world music and live sound healing journey with a trained sound therapist and shamanic practitioner. 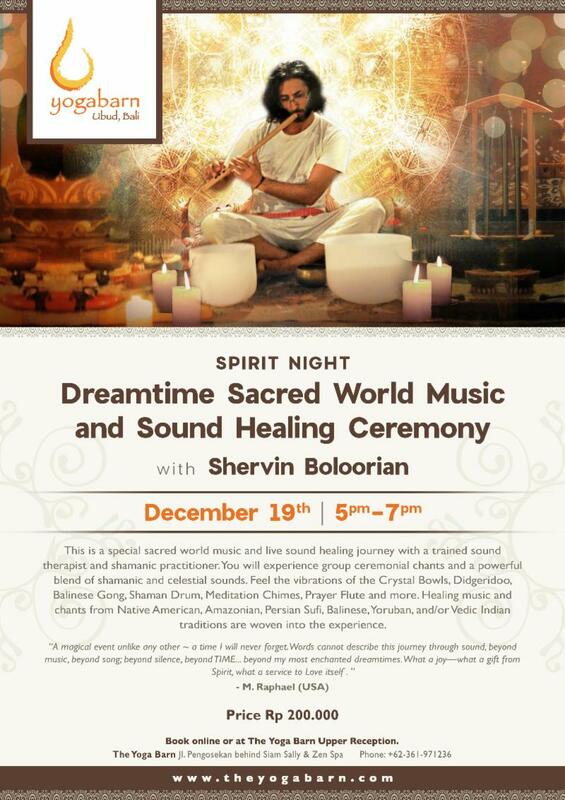 You will experience group ceremonial chants and a powerful blend of shamanic and celestial sounds. Feel the vibrations of the Crystal Bowls, Didgeridoo, Balinese Gong, Shaman Drum, Meditation Chimes, Prayer Flute and more. Healing music and chants from Native American, Amazonian, Persian Sufi, Balinese, Yoruban, and/or Vedic Indian traditions are woven into the experience. Do you feel lost? Are you searching for ways to connect more with your inner self? Let 'The Seeds Of True Self' help you heal. 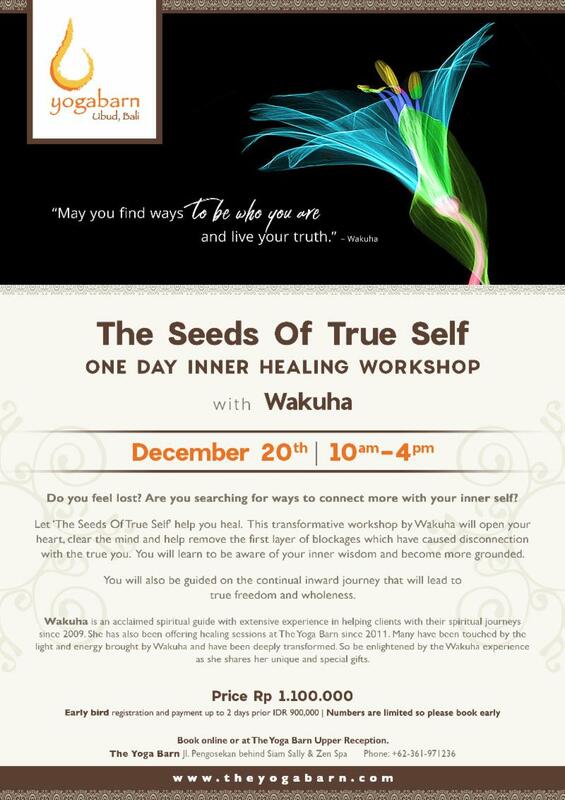 This transformative workshop will open your heart & clear you mind. Remove the layers that create obstacles to your connection with the true you. Feel grounded with a heightened awareness of your inner wisdom. 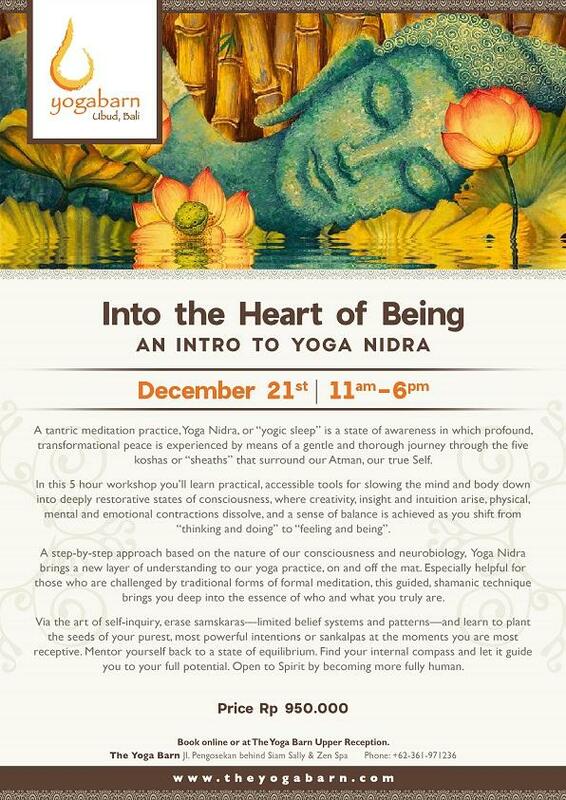 Dive into a unique Yoga Nidra workshop experience laced with the world class teachings, traditional philosophy, neuroscience research and applied yoga nidra practices. Experience what is known as "the sleep of the yogi". This is a special opportunity to add a deeper layer to the restoration of your yoga and meditation practice. Create a sense of balance as you shift mode from "thinking and doing" to "feeling and being". Let this state be your compass for true living. Are you ready to fly? In this 3-hour comprehensive workshop, we will cover the fundamentals for developing an inversion practice, going through headstand, forearm balance, and handstand in a step by step process designed to de-mystify going upside down. This workshop will begin with a strong flow sequence to get you warm and awake, and then we will begin to break down these postures. 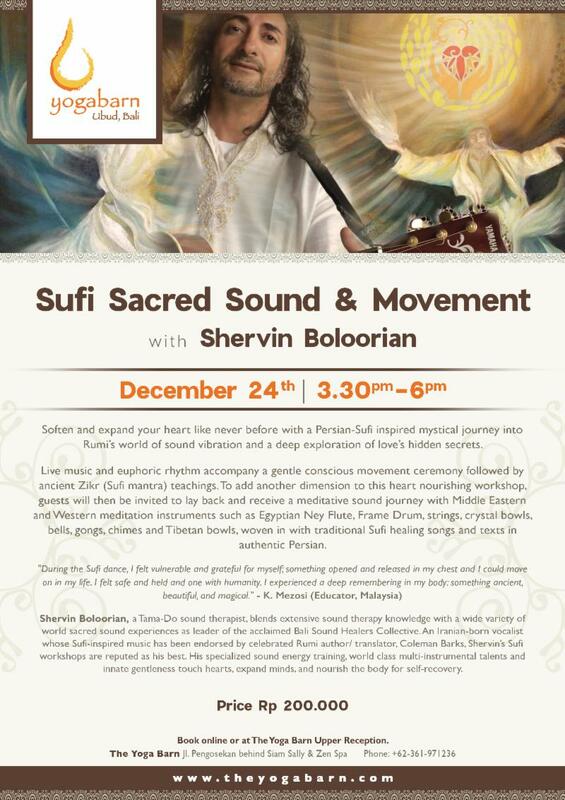 Soften and expand your heart like never before with a Persian-Sufi inspired mystical journey into Rumi’s world of sound vibration and a deep exploration of love’s hidden secrets. Live music and euphoric rhythm accompany a gentle conscious movement ceremony followed by ancient Zikr (Sufi mantra) teachings. Why do we smile when we see a beautiful flower, feel the wind caress our face, experience a breathtaking sunset? 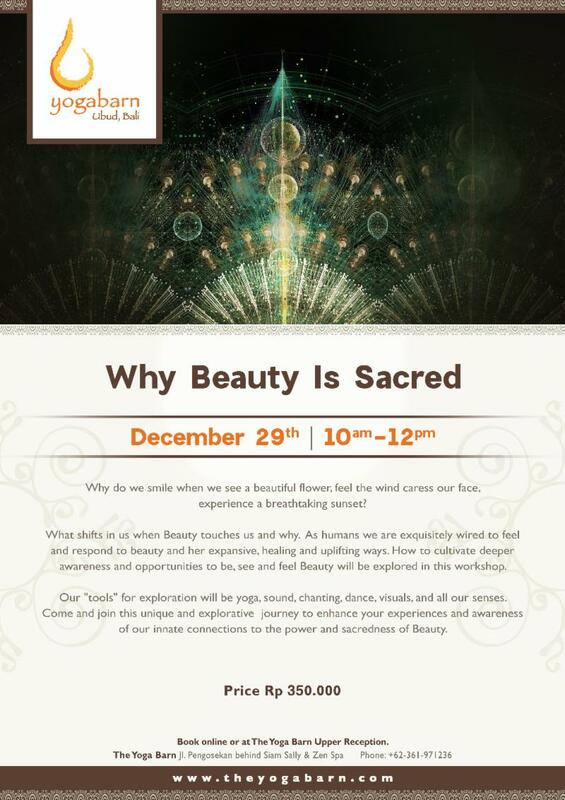 What shifts in us when Beauty touches us and why. As humans we are exquisitely wired to feel and respond to beauty and her expansive, healing and uplifting ways. Raise your awareness to the beauty in life through yoga, sound, chanting, dance, visuals, and the use of all our senses. Extend your 3-Day Juice Cleanse to a 4 or 5 Day program! Our loved, transformative, self-guided 3 Day Juice Cleanse program can now be conveniently extended for additional detoxing benefits with Day 4 and Day 5 packages. The bonus for these self guided retreats is you can start any day of the week. By booking your Juice Cleanse you are pressing the pause button and allowing your whole body to relax and repair, the only responsibility you have is to pick up your juices and arrive for your colon hydrotherapy, infrared sauna and Spa treatments. It is juice fasting made easy. Day 4 and Day 5 extensions are now an option if your mind and body feel the need to optimize your experience. For all our program details see here. 7-Day Detox Fasting Healing Retreat. Be excited about reaching your highest potential in a supported and structured environment, learning as you experience the fasting-cleansing process. Our program includes lectures about Bio-Spiritual Nutrition and whole person ecology, fasting, eating healthy and dharma. All juices, supplements, Yoga Barn 10 class card for yoga, meditation and sound healing as well as detox-enhancing treatments are included. Transform your life. 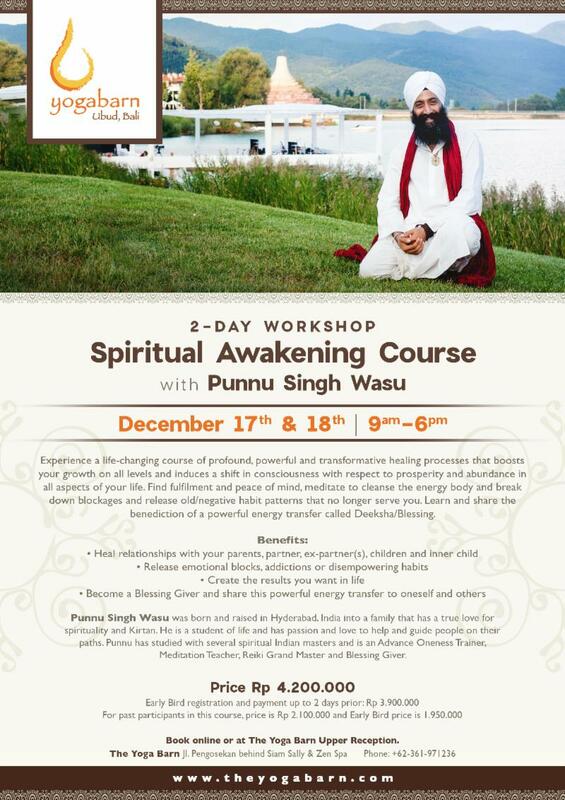 Finish your retreat clearer, more conscious, more alive, more immune-intelligent, and divinely Awake. Find out details here and note there are limited spaces and Early Bird discounts apply so book early. Community is at the heart of what we do with many grassroots charities and organizations partnering with us to make a real difference to the lives of people in Bali and beyond. Education, instruction, inspiration and funding encapsulates how we engage and support not only the local community but broader yoga community as well. On our December schedule it is worth highlighting our Community Classes with pre-natal yoga, heart talks, Yoga in Bahasa, astrology, acro play and general yoga. Special class rates apply for Balinese locals, expats living with valid KITAS and children. See our website here for more information. Do you love puppies? On Sunday 2nd December BAWA - Bali Animal Welfare Association will be visiting us with a puppy pen in our amphitheater to share Bali dog care, petting, fostering and adoption information. If you fall in love, you can take a dog home with you! All dogs visiting have been sterilized and vaccinated. So if you know anyone keen to foster or adopt a dog invite them along for a morning of puppy love! December 1 kicks off the calendar month with Tumpek Uduh ceremony which is dedicated to Balinese plants with reverence for fruit and flowers. December 25 Christmas is celebrated in the Christian Balinese, Palasari and Blimbingsari communities in Bali where Balinese & Christian architecture blends, both offering Christian services. December 26 is Ga lungan (Yoga Barn opens at 2pm) where Hindu Balinese commemorate the legendary battle of good versus evil, the victory of dharma over adharma. It marks the time when ancestral spirits of deceased relatives visit the Earth. The last day of the celebration is Kuningan, when they leave Earth. The spirits of deceased relatives return to visit their former homes and the Balinese have a responsibility to be hospitable and welcoming to their past ancestors through prayers and offerings throughout their home. Local cinema Paradiso in Ubud recently launched an Indigenous Film initiative featuring cultural films on the 2nd Friday of each month. Focused on raising awareness of indigenous peop le and cultures it will raise funds for training, equipment and travel costs of Indonesia's up and coming film makers. The films will cover a lot of different subjects including indigenous land rights, environment, cultural wisdom, community issues and solutions, language preservation, indigenous education and arts. Funds from every ticket sale and meals purchased on the nights will be donated to Yayasan Ranu Welum, a youth indigenous organization based in Kalimantan. Keep up with more updates and features on our Facebook and Instagram.